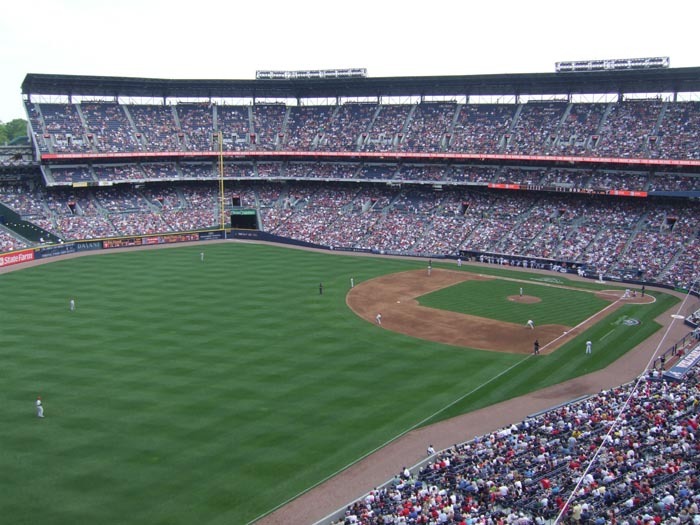 The 2015 season marks the second to last year the Braves will call Turner Field home before moving north of Atlanta to a new ballpark in 2017. The ballpark was originally built for the 1996 Olympics and was converted into a baseball stadium. 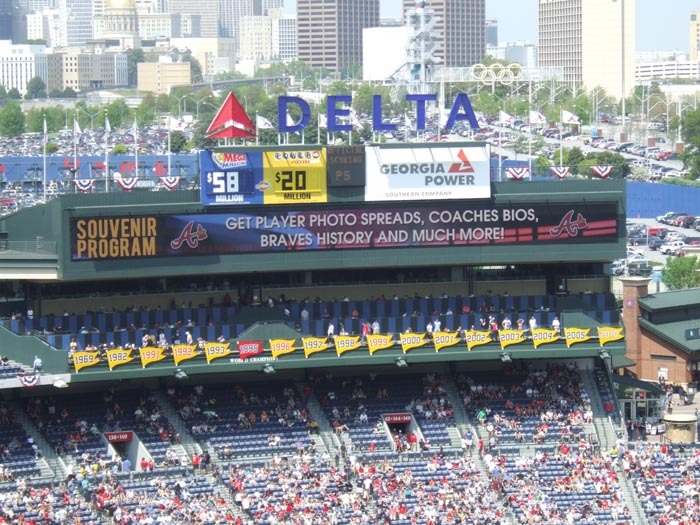 It replaced Atlanta Fulton County Stadium, a multipurpose stadium the Braves shared with the Atlanta Falcons (NFL). 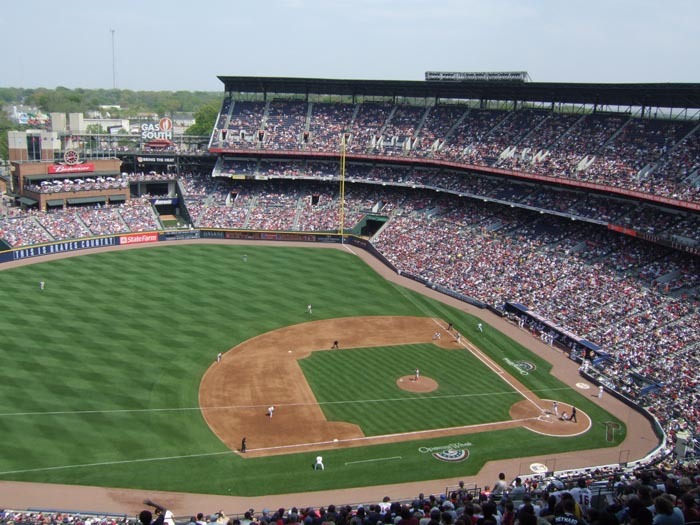 During the late 1980s the Braves began pursuing a new ballpark and the city of Atlanta began to via for the Summer Olympics. 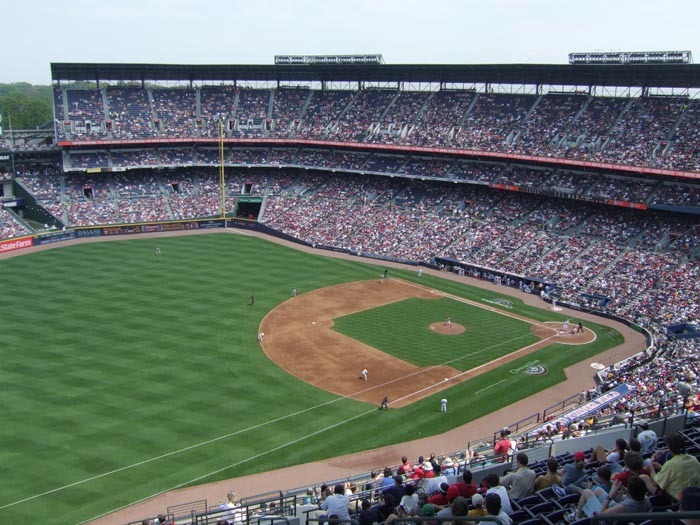 In 1990 the International Olympic Committee announced that Atlanta would host the 1996 Olympics Games leading the city and Braves to join forces in building a stadium. The stadium would first host the Olympics and then be converted to a baseball only facility. A site just south of Atlanta Fulton County Stadium, on city owned land was chose to construct the stadium. Plans for the facility were unveiled in November 1992 and construction began in July 1993. The ballpark was built and shaped for the purpose of baseball. The exterior is brick and limestone, similar to other ballparks. Temporary bleachers were built beyond the outfield fence to allow for a larger capacity for the Olympics. After the Olympics ended, the stadium was retro-fitted and converted to baseball. The columns that supported the bleachers are now posts for a fence that surrounds Monument Grove plaza. 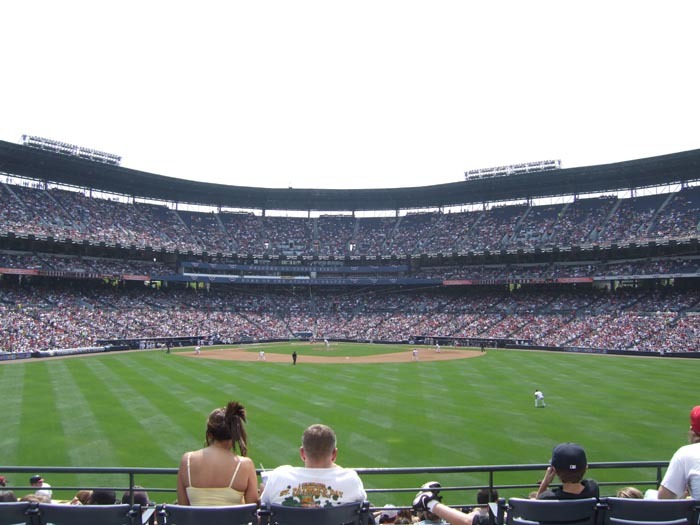 On April 4, 1997, 50,096 fans watched the Braves play their first game the state of the art ballpark. 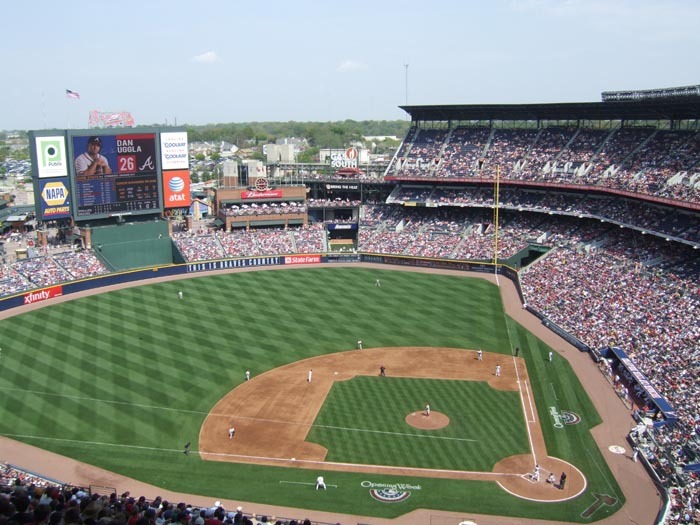 The stadium was named Turner Field after then Braves owner Ted Turner. 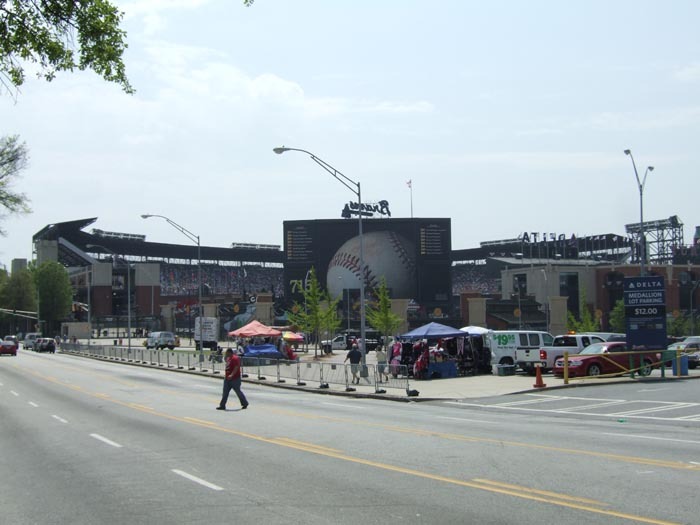 Upon arriving at Turner Field, many fans park north of the ballpark, beyond the outfield stands. Walking toward the ballpark, fans pass over the former site of Atlanta Fulton County Stadium. The base paths and playing field is marked out in what is now a parking lot, and part of the retaining wall of Atlanta Fulton County Stadium remains. 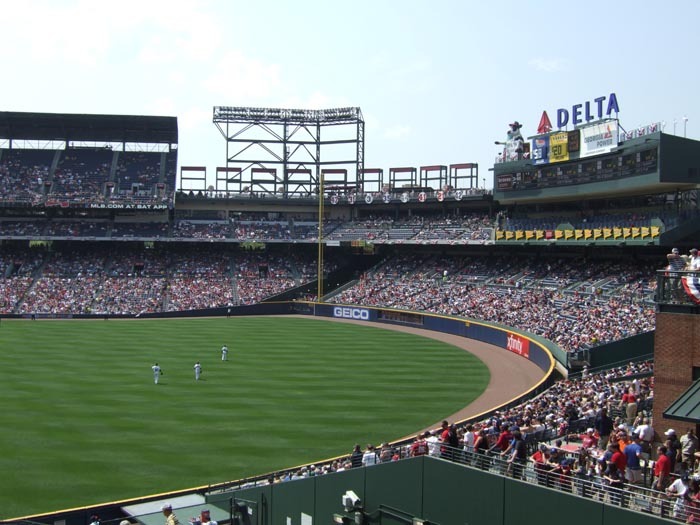 As fans approach the ballpark they can see the brick and limestone walls of Turner Field and the blue seats in the upper deck. There are many entrances around the ballpark, with most fans entering through the Grand Entry Plaza. Inside this area includes an entertainment/concession areas of food and game filled pavilions, Scouts Alley, and Tooner Field. A 100 foot diameter photograph of Hank Aaron’s 715th homerun ball dominates the Plaza side scoreboard. Adjacent to the plaza is the Braves Hall of Fame and Monument Grove. Upon entering the ballpark fans are on the field level. 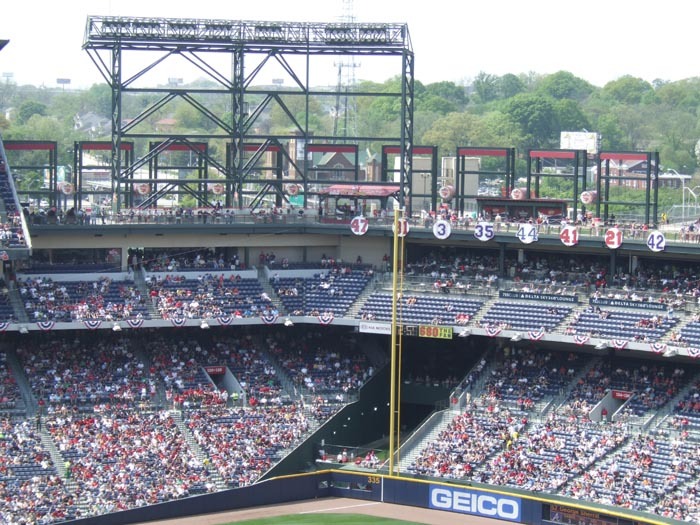 Ramps, stairs, and escalators throughout Turner Field take fans to the terrace level, the Lexus level and the upper deck. The field level seating section extends from the left field foul pole around to home plate and to the right field foul pole. Additional seating is located in leftfield and in parts of right field. 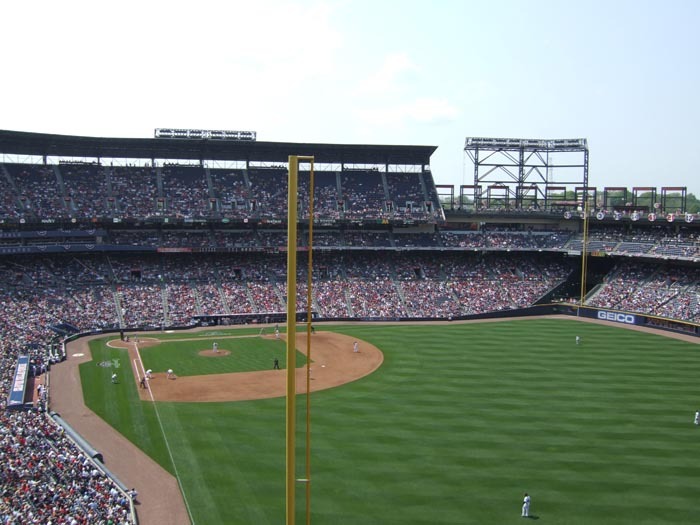 The Braves bullpen is located between the field pavilion seats in right field and the opposing team's bullpen beyond the left field foul pole. Fans can walk the entire lower concourse and never loose site of the action on the field and can watch pitchers warm up in the bullpen. The next level up, the Lexus level, extends from right field to the right field foul pole around to home plate, and down and around the left field foul pole to the 755 restaurant. Not only is this the suite area, but is also an area where fans can purchase individual tickets for games. Perhaps the best part of this level is the air conditioned concourse. The upper deck extends from right field to the foul pole and around to home plate and down the third base line. From the concourse fans can see the surrounding neighborhood and the Atlanta skyline. The upper level concourse extends from behind the upper deck down the third base side into left field where the Coca-Cola Sky Field is located. This area features picnic tables, views of the stadium and the city of Atlanta, and a 38 foot tall Coke bottle. The 80ft by 72ft high definition video board, added before the 2005 season, is located above the hitters backdrop in centerfield. 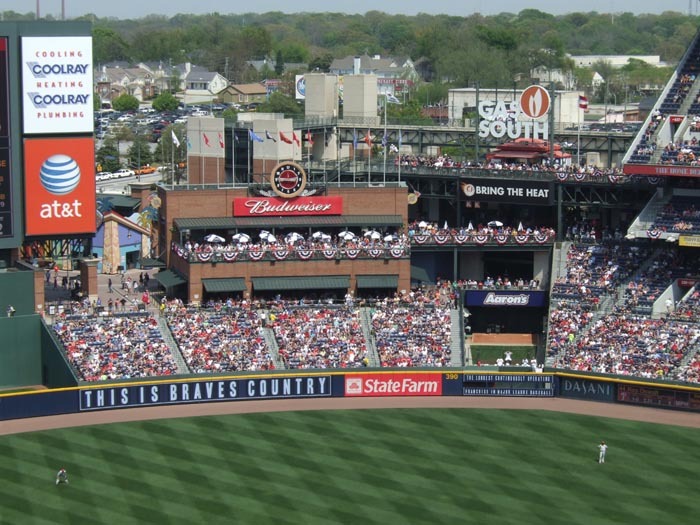 Attractions at Turner Field include: Turner Beach, that is located on the right field Lexus Level patio overlooking the field and features a cabana bar, food concessions, a picnic area, and lounge chairs. Monument Grove is located in the Grand Plaza Entrance and includes statues of Hank Aaron, Phil Niekro, Ty Cobb, and many other Braves greats. Trees, park benches, and a picnic area are also located in this area. Scouts Alley is located behind the left field seats and is a location where fans can learn about scouting. This area also allows fans to test their throwing and hitting skills. Trivia games and other interactive activities are located here. The Braves Chop House is an 8,000 square foot dinning restaurant located above the Braves bullpen, which allows fans to dine during the game. The Braves Clubhouse Store is located in the plaza area and features a large selection of Braves merchandise. Fans can sit outside the store and watch multiple games of baseball games being played around the country at that time. 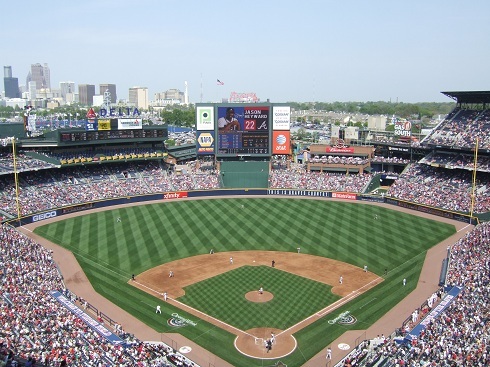 Prior to the start of the 2005 season, the Braves spent $15 million in improvements to Turner Field. 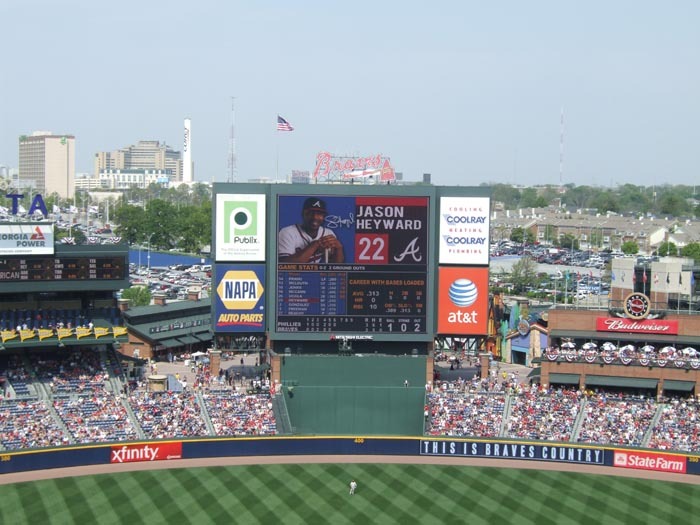 This included the new high definition video/scoreboard replacing the old one, ribbon boards were added along the upper deck and a new restaurant was constructed in right field. After the 2007 season, 158 seats were added directly behind homeplate that are only 43 feet from the action. These are the most expensive seats at the ballpark and have access to a 5,000 square foot lounge adjacent to the Braves clubhouse. 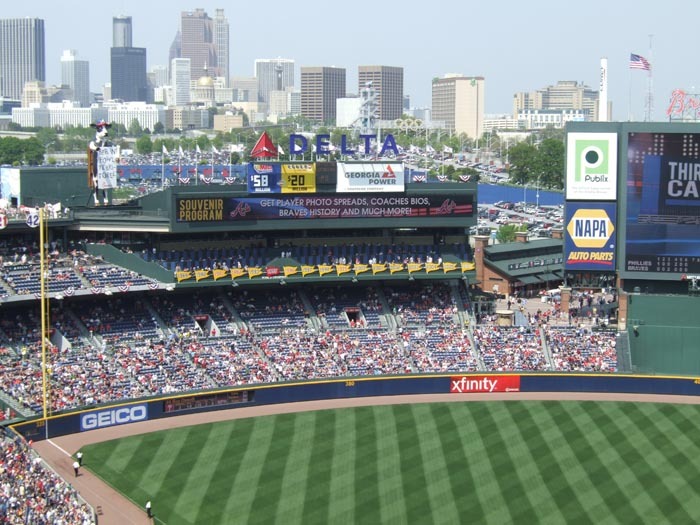 In November 2014 the Atlanta Braves announced plans to build a new stadium, SunTrust Park, in Cobb County, moving there in 2017. 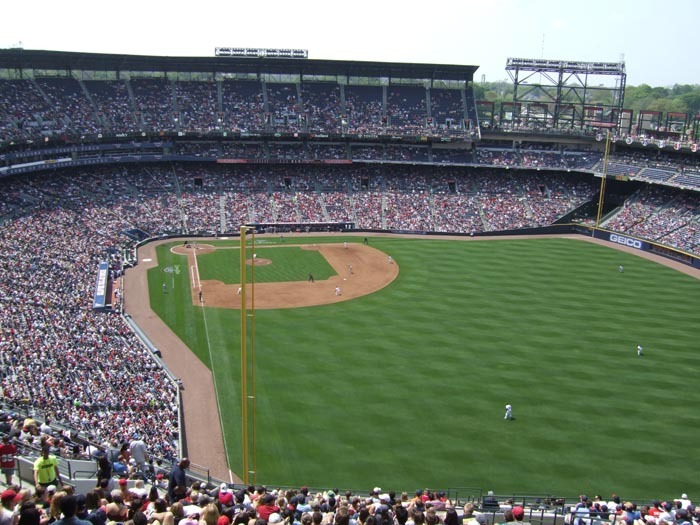 The team's 20 year lease ends at Turner Field after the 2016 season allowing the Braves to move. 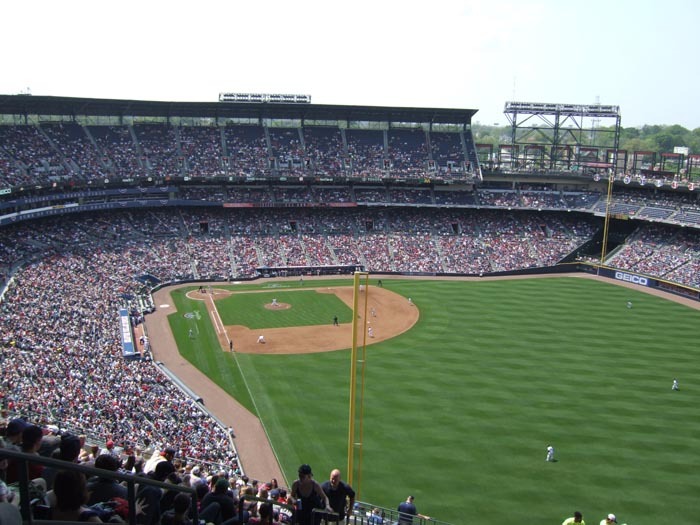 Team officials stated Turner Field would require at least $150 million in infrastructure work, new seats and other work to remain a viable option for the Braves. 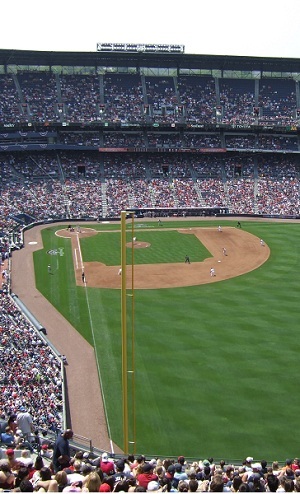 In December 2015 the Atlanta Fulton County Recreation board announced that Georgia State purchased the stadium and parking lots. It will be redevloped as a smaller stadium for the Georgia State football team and other sports programs. 10-Time Gold Glove winner Andruw Jones. Cy Young Winners: Greg Maddux, Tom Glavine, and John Smoltz. Randy Johnson throws a no hitter against the Braves on May 18, 2004. John Smoltz's 3,000th strikeout on April 22, 2008.